The Thule Perspektiv Messenger Bag is a tote suitable for your daily commute or a weekend overnighter. 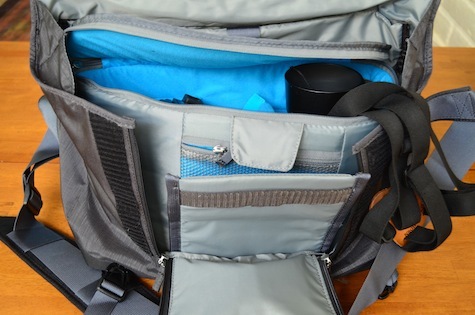 Persketiv becomes more than a mere tote or duffle when you unzip its cover and realize there’s a well-padded removable compartment inside that can accommodate a Digital Single Lens Reflex (DSLR) camera with a 70-200mm lens and battery grip attached. In addition, there’s a separate padded compartment for a 15-inch MacBook Pro, as well as an abundance of small zippered compartments suitable for SD cards, extra batteries, filters, and other small objects. The Perspektiv hangs comfortably across one shoulder from a wide, well-cushioned strap. An additional waist strap is provided to improve stability. Everything inside the main compartment is reachable through a zipper in the cover that opens into the modular unit. The modular unit has its own zipper and handle. This means the removable unit with your camera gear can be accessed on the go or removed and stored in a hotel’s safe if you’re traveling. For all of its zippered and velcroed compartments, the Thule Perspektiv Messenger Bag seemed designed for marginal functionality. The many zippered compartments unfold from the front of the pack like nested Russian dolls, with many of the spaces being too small to be of practical value for such items as a battery charger or flash attachment. If the Russian doll analogy has you baffled, read about them here. The Thule Perspektiv Messenger Bag fits in an overhead compartment or under the seat in front of you on a plane. Perspektiv feels sturdy and the zippers are high quality for maximum weather protection. 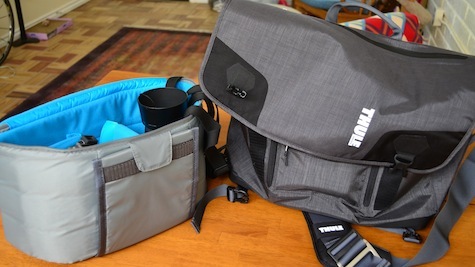 If you’re looking for an all around messenger bag for casual use, the Thule Perspektiv Messenger Bag is worth checking out. Serious photographers with more demanding needs will want to look elsewhere.